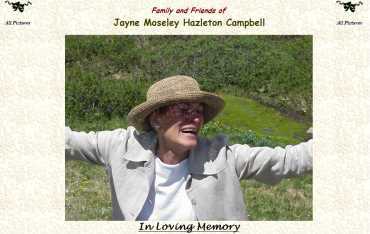 Jayne Campbell Memorial - a site dedicated to the memory of Jayne Moseley Hazleton Campbell. Photos were taken of friends and family at the time of the Memorial Service for Jayne. Click on 'All Pictures' to view Thumbnails, or view individual pictures in a 'Next/Back' format. A Cross-Link to Ever and Forever provides a Bio of Jayne's life.